With all the components at work inside your home or commercial AC system, it’s wise to leave your AC unit repair to proven professionals. The staff at Hughes Air Heating & Cooling has a long track record of success when it comes to central air repair as well as air conditioner repair on split systems. When it comes to all kinds of Trane air conditioners, we’re ready to step in and put an end to your AC repair troubles. There’s simply no reason to tough it out when the temperatures climb. We make quality workmanship our number-one priority, and we can be there soon to tackle your air conditioner repairs. When it’s time for air conditioning service, don’t sweat it! Instead, make it easy on yourself with one quick call to the air conditioning repair pros at Hughes Air Heating & Cooling. Offering three decades of experience in residential and commercial AC repair, we have the training and techniques to keep both central AC units and ductless split systems in tip-top shape for the long term. Why run the risk of getting shoddy air conditioner repair when our Mesa-area contractors are dedicated to bringing you thorough and lasting results? Forget about calling the other guys! Let us make swift work of your next AC repair appointment. Schedule your air conditioner service today over the phone or online. The best way to avoid facing major air conditioning repairs is to take the proactive approach. By becoming a maintenance contract customer with Hughes Air Heating & Cooling, you can stay on top of all your HVAC needs the whole year through, including essential air conditioner repair. Having a maintenance agreement in place also eliminates the hassle of calling to book appointments season after season. Rather than you having to remember to schedule your air conditioner service, we’ll get you on our list and let you know when the time is right. In the end, you’re likely to save time, trouble, and money when you sign on with us for regular AC repair checkups through a convenient maintenance contract. Call us today for details! Whether you’re in Mesa, Scottsdale, or Chandler, Hughes Air Heating & Cooling is the name to know for reliable air conditioning repairs. Don’t compromise your comfort in the Arizona heat. Set up your appointment now with our licensed, bonded, and insured professionals. We can even help with your emergency AC repairs. All you have to do is call. Your Trane AC unit is designed to provide you with reliable, long-term performance. Bringing in Hughes Air Heating & Cooling when you need air conditioning repair helps ensure the correct procedures are followed and the right parts are installed. That’s your best bet for getting your Trane back on its feet for years of additional cooling comfort. 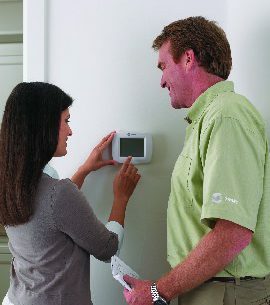 Learn more about how our Trane Comfort Specialists can help with AC repair when you contact us now.